Do you have a business or nonprofit idea you want to advance? Spark grants are $500 grants (that you do not have to repay) that allow one to test the feasibility of an idea. The funds can be used to purchase prototyping supplies, marketing materials, hire contractors, or other purposes related to your business or nonprofit venture. All students (undergraduates and graduate) are eligible to apply. The application deadline is March 10. 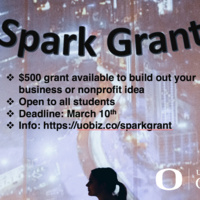 To view details and apply, visit https://uobiz.co/sparkgrant. Questions? Contact Kate Harmon, Undergraduate Program Manager for the Lundquist Center for Entrepreneurship at kharmon2@uoregon.edu.